Martin Stacey is a multi-instrumentalist and vocalist who has previously captured the power of progressive heavy metal, and this album is no exception. 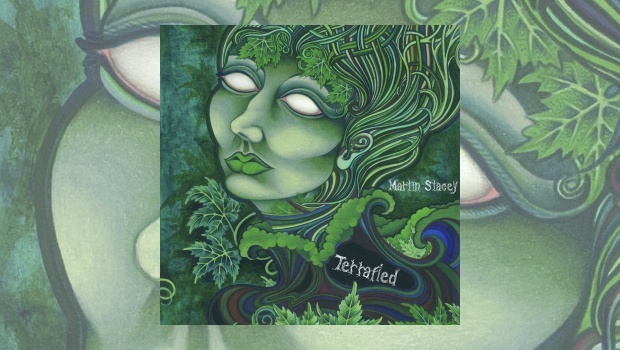 In fact, Martin describes Terrafied as being more experimental and progressive in sound than its predecessor, Bliss in Undertow (cool title, huh? ), the album with which I discovered Martin’s music when I reviewed it over at Sea Of Tranquility. Beached opens this new chapter in Stacey’s musical journey with cool keys, exploding drums and silver–metal lead guitar chords. The anthemic symphony of sounds is broken when Stacey sings, “I stare now at a cloudless sky, unblinking”. The drums thunder around him as heavy bass and lead guitar grind out their rhythm, like an earthquake of sound. We are off to a great start. On the other hand, Terrafied is not as terrifying as its title may suggest; “I’m drawn to the horizon; the quickness of the dawn; familiar and alien at once”. The drum work on this track is primarily Taiko, solid and well hammered. The electric guitar solos are some of the best on the album and compare well with some of David Gilmour’s from mid-career Pink Floyd. The mid–song, almost shocking screams bring back memories of the title track to The Good, The Bad And The Ugly, perfectly placed to deliver the desired shock to the system, well described in the lyrics: “Hold it in. Hold it all together”, as the keys take us out. Oblivion hits you hard with powerful drums, the Taiko drum is so well placed at the beginning, whilst the keys and symphonic sounds herald one of the best songs on the album. The melody is great and the lyrics are deep; “Entropy and sweet oblivion. At the end we’re gonna say goodbye”. The brooding keys, thumping drums, deep bass and lead guitar solos create a throbbing soundscape, and the acoustic guitar that closes the track is excellent. Gnossienne No. 1, Stacey’s interpretation of the famous French composer Erik Satie’s piano compositions, is a darkly menacing symphonic masterpiece, like something out of a movie soundtrack. This instrumental piece is one of the best surprises on the album. Strong drum thuds and powerful surrounding chorus echoes drive the song forward, along with orchestra level cellos from Kakophonix, Stacey’s bandmate in Empyrean Throne. If Gnossienne No. 1 was a surprise then You Are the Sky offers one of the best vocal performances. In one of the more positive moments of the album Stacey sings, “You are the dreamer and you are dream, manifestation of everything you’ve ever done… I know we lose in the end. Until then why not win?”, powerful vocals, almost yells, surrounded by orchestration, drums and shining lead guitar. Across the rest of the album, Early Mourning opens with acoustic guitar, drums, choruses and surrounding keys. Loss fills the air on this slow-moving rhythm. Unkind Conspiracy opens with lead electric guitar filling the air, while rhythm guitar surrounds. The piano is played by Unicorn Death lead singer and pianist Cassie Morris to dramatic effect, whereas Pyroclastic Reveries features some of the album’s best volcanic lead guitar and metal stopping drums. The second and third guitar solos are delivered reverently by Scott McClure, who has his own project called Elevate The Sky. The Lunatic is another full-on power guitar anthem, full of flaming lead, deep bass and drums that fill the expanse of your ears. Concluding Terrafied is Tu Me Hante a swelling keyboard, bass and drum instrumental with slow played guitar filling the soundscape. Martin Stacey has done it again, creating an original and compelling composition that lifts as well as making you contemplate life and how to live it before the end.